Hello there! Jess Haines here. I’m the author of the urban fantasy H&W Investigations series (HUNTED BY THE OTHERS, TAKEN BY THE OTHERS, and the recently released DECEIVED BY THE OTHERS). I’d like to take a moment to introduce you to some of the cast—Shiarra Waynest, the lead character, Chaz, her on-and-off werewolf boyfriend, Alec Royce, a vampire Shiarra meets in the course of her adventures, Sara, Shiarra’s business partner, and Arnold, a mage and Sara’s boyfriend. In honor of Tynga’s event, they’re going to discuss fairy tales today. Over to you, Shia! Shiarra: Which fairy tale were we supposed to talk about again? Royce: Beauty and the Beast? Chaz: Little Red Riding Hood? Arnold: The Legend of Zelda: Ocarina of Time? Royce: Is that a real legend? I’ve never heard of this. Shiarra: Whatever. I think that one gets a “hell no”. Arnold: Damn it. I brought my ocarina and everything. It’s a certified replica! Royce: I could share a few fairy tales. Shiarra: You? Forget it. They’re probably filled with blood and bitey things. Royce: Not everything has to be about death and blood with me, Ms. Waynest. I’d have thought you’d learned as much by now. Sara: Whatever, I’m with Shia. I don’t want to hear about what kind of stories put the vampire to sleep as a kid. Chaz: You know, I don’t think it actually fits, but I’ve got a great fairy tale! Chaz: It’s about the guy who had to choose a bride by how she cuts the cheese. Royce: You can’t be serious. Sara: Wow, I didn’t think vampires were allowed to laugh at fart jokes. Royce: That one caught me off guard. Chaz: Seriously! It was one of those Grimm fairy tales. Arnold: Hehe. Cut the cheese. Chaz: Dude, do you want to hear the story or not? Shiarra: Err. Well, I guess it can’t be that bad. Chaz: Awesome! So this shepherd couldn’t choose which of three sisters to marry. Arnold: What? It’s a legitimate question. Royce: Why aren’t we talking about a real fairy tale? I can think of a few far more interesting than this. Chaz: Shut up, dead man. Anyway, the dude’s mom tells him to give each of the girls a cheese. One didn’t cut off all the rind, one cut off some of the good cheese, and the third one was super careful when she was cutting off the rind on hers, and so he married that one. Sara: Um. What was the point of telling us that story? Chaz: It was the only one I could remember? I dunno. C’mon, I’ve been wanting to tell that one for years! Shiarra: It’s Hercules. Not Heracles. Royce: Actually, his original name was Alcides and they’re both a slight bastardization of the original pronun—wait, why are you correcting me? Sara: Haven’t you seen the movie? I like the pegasus. Arnold: The satyr was dope. Danny DeVito was hilarious. Chaz: I liked Hades. He cracked me up. Shiarra: His hair being on fire was a nice touch. Royce: That movie was about as historically accurate as Xena: Warrior Princess. Shiarra: What? You watched Xena? No way. Royce: This conversation is over. Chaz: Damn. Next time, I’ll think of a better story. Royce: Somehow I doubt that very sincerely. Well, that was… uh… enlightening. You can learn more about Shiarra and the rest of her friends in HUNTED BY THE OTHERS. What do you guys think of Chaz’s story? What’s your favorite fairy tale? Thanks again having me and the gang over, Tynga! The author has over 6 years freelance experience in technical writing, editing and screenplays. More recently, this repertoire has expanded to include short stories and a series of urban fantasy novels in progress. I don't really know the characters yet, but I think from this that I like Chaz the best. That was so fun. I loved it. Chaz was great. Chaz cracks me up! Cut the cheese, what a kidder. I love this series! Chaz of course! Seems like so far everyone agrees! I have to jump on the Chaz bandwagon myself. Thanks for the awesome "interview" it was fun to have a guest cast and I'm especially eager to start this series now. I like Arnold, the funny ones always interest me. 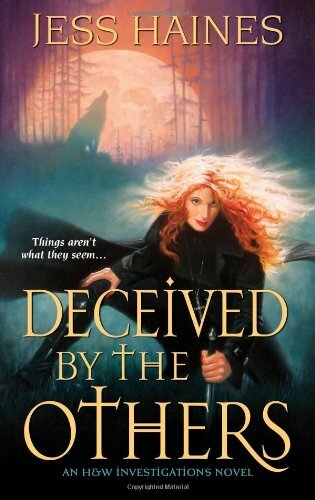 I just picked up Taken by the Others, so I'm all ready for Deceived by the Others - this giveaway is perfect. I haven't read any of Jess Haines' books yet so all her characters sound good in the blurb. I haven't had a chance to read any of these yet, but all the characters seem great. If I had to pick from what I read, then Arnold-anyone with their own certified ocarina is aces in my books :). This was a fabulous and hilarious post-cracked me up. I liked Chaz, his story was pitaful but at least he tried. Thanks for the giveaway. Shiarra is my favorite character. She is sassy and hot and gets the job done and that's the kind of character I want to be my friend. Thank you for the awesome post and giveaway opportunity. I loved the first two in the series and would love to read this as well. Aw isn't anyone going to choose Royce. I wanna know about his fairy tales :). Chaz is really funny. But theres something about Royce. Think its going to have to be a tie. ahem well my fav character from the Others' series is Chaz hands down. This series has been great! I, glittergirl forgot my email address above so I'll repeat my comment: Arnold is my favorite character because he's a little "outside the box". The banter was great! My favorite fairy tale is Cinderella because she goes from hopeless to belle of the ball and gets her HEA. Chaz was very funny! Thanks for the giveaway! I like Royce he reminds me of me! I really like Chaz! Thanks for the giveaway! I love Arnold because he's kind of geeky, but cute also, and I think he has Shiarra's best interests at heart. I haven't read the books yet, but based on this discussion, I'd have to say Chaz. It seems like the guy tries really hard to no avail hahaha. And because I have a thing for werewolves, of course ;). I always get a kick out of Arnold. Geeks are hot. I gotta go with Chaz!! I read the first one a while ago and haven't had a chance to read second one. However would love to get this one so I have a reason to buy the sedond one LOL. From what I read I laked Chaz...but I haven't read the series!